Col. William Jefferson Gatewood, 1830-1888, was born in Gallatin County, Illinois, the son of Illinois state senator William Jefferson Gatewood and Elewisa Hubbard. His father died young, his mother remarried and William Jefferson - "Jeff" - joined the army and later set out for California with all the other Gold Rush travelers. He married Mary Crosthwaite in Sacramento, lived in San Andreas, in the California foothills, where he practiced law and served as the District Attorney for Calaveras County. He left for San Diego in 1868, where Mary's brother, Philip Crosthwaite lived, and was one of the founders of the San Diego Union newspaper. He and Mary lived in Old Town in San Diego. She died there in 1881 and he died in 1888. They are both buried in Mount Hope Cemetery. "Wife Died in 1881" - Newspaper clipping, undated, name of newspaper not noted. Gatewood File, San Diego History Center, Research Library, Balboa Park, San Diego, California. 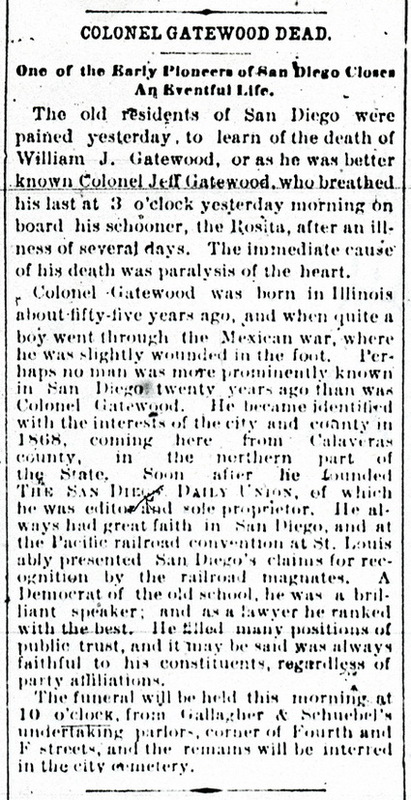 "Colonel Gatewood Dead" - Obituary of William Jefferson Gatewood, San Diego Union, Tuesday, 27 March 1888, p.5, col. 4. 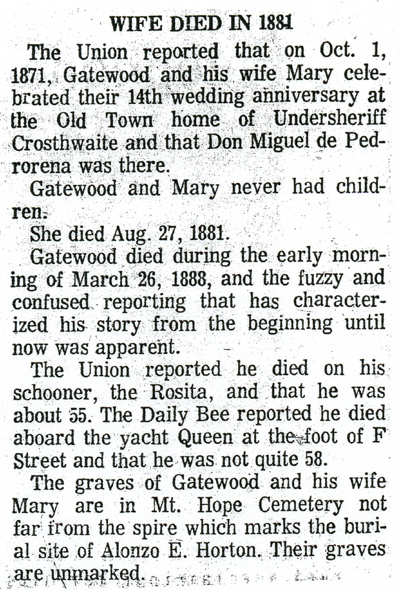 Mary C. Gatewood's obituary - San Diego Union, Sunday 28 August 1881.